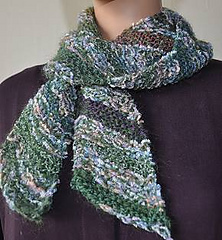 This scarf is knit with Kid Merino doubled held along with Aria. (2 strands Kid Merino + 1 strand Aria). Increasing on one end and decreasing on the other end, along with the self-striping nature of Aria, create the diagonal fabric. Marker for edge of scarf - stitch marker or just a safety pin. Tip: Do not try to knit from both ends of Kid Merino ball, you will have tangles. Re-wind half the ball into a second ball and work from both balls.